After a long, cold winter in Chicago, my 2008 Bonneville is running again as of yesterday. I last rode it on November 19th, when I had an accident resulting in a broken ankle. I’ve been working and upgrading the Bonnie during my recovery, and both the Bonnie and my ankle are getting close to being ready to ride again! 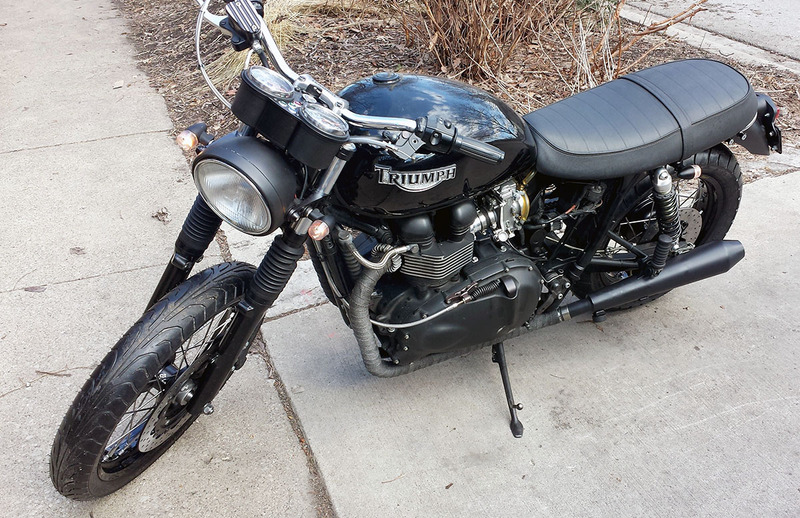 Saturday, March 22, 2014, my friend Lee rode his Bonnie out to see me and to inspect my progress. It was also a good excuse for him to get out and ride! I told him then that I hoped to get my Bonnie running the following day on Sunday. Well, my mission was accomplished! Header pipes have been wrapped with 2″ black exhaust wrap from British Customs and finned exhaust header clamps added from Maund Speed Shop. Black South Bay Dominator slip-on silencers from New Bonneville have replaced the (damaged) polished stainless BC Predators. Stock chrome wheels have been replaced with Excel rim/Talon hubs in black from BellaCorse, and wrapped with Dunlop GT 501 tires. The instrument cluster has been remounted in a lower billet aluminum bracket designed and fabricated by D9 Brackets. The ignition switch has been relocated from the left side (formerly in a Joker Machine bracket) to the center of the new D9 Bracket. The right side rear brake pedal has been drilled and satin polished. The front brake has been replaced with a Brembo brake upgrade kit from New Bonneville. The damaged left clutch handle has been replaced with a used good one from eBay. Mount bobbed front fender that has been recoated with black Plasti Dip, along with the Superbrace fork brace. Replace the stock oil cooler and hoses with an oil cooler upgrade kit from Bonneville Performance. Replace the stainless steel throttle cables with new slightly longer longer ones from Barnett. Replace the slightly bent gearchange shift lever shaft, and related seals, then mount the drilled and satin polished gear shift lever as well. Recoat the transmission cover with black Plasti Dip when it is off for the above gearchange shaft replacement. Finished coating the side covers with black Plasti Dip and mount on bike. Mount the new left foot peg and the original right foot peg. I’m thinking I need one or two more good weather weekends to get this all completed… maybe it will be ready by mid April? I hope so! 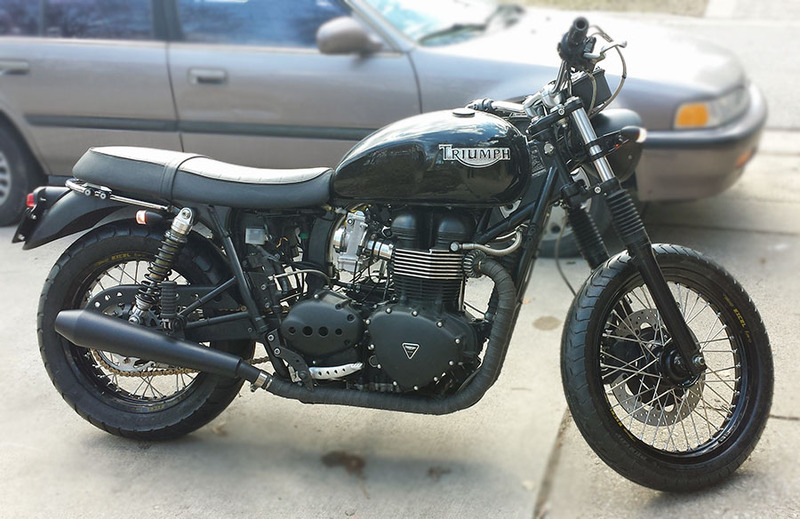 Since the accident on November 19, 2013, I started the Bonnie only once or twice as it sat in my garage over the winter. My memory is that I did it once in December (on crutches in a cast), and once again in January when the weather got to be a decent temperature. I just went out to my garage, and started the Bonnie and let it run 10-15 minutes. However, the Bonnie has not been started again since January. 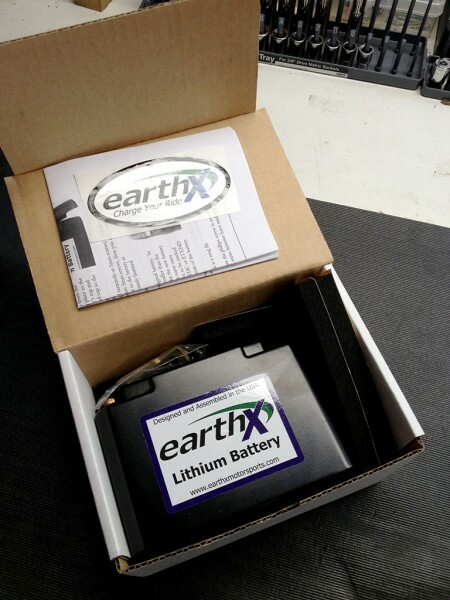 The EarthX Lithium battery has not been on a trickle charger or even removed from the Bonnie the entire time. Yet, I was still able to start the engine yesterday without a charger. I’d say that is pretty impressive battery performance! 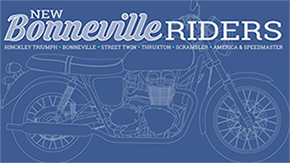 Randy, great site thanks, I just recently acquired a 07 bonneville and I’ve been reading your site. I’m in St. Charles so maybe we’ll get to ride next year.